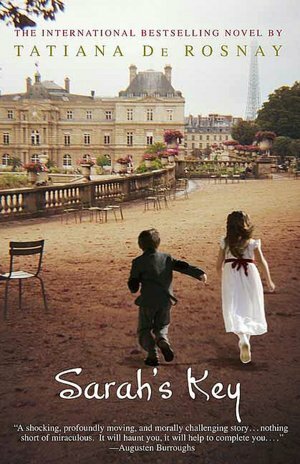 Ten year old Sarah Starzinski is taken along with her parents, and other thousand of Jewish families with children, in the middle of the night in the midst of the summer of 1942 and transported to the Vel’ d’Hiv, a velodrome in the heart of Paris. For days, they endure the most inhuman conditions then all of them are temporarily moved to concentration camps in the outskirts of Paris where parents and their children are separated and subsequently shipped in cattle wagons by train to Auschwitz and their deaths. Sixty years later, investigative journalist Julia Jarmond is assigned to write a story of the roundup at Vel’ d’Hiv due to an upcoming commemoration. As Julia begins interviewing witnesses, she uncovers a link between the family she is married into and Sarah, a secret that has been kept for sixty years, and her life gives a 180 degrees turn. As promised not long ago in this blog, I read Sarah’s Key. And after I finished all I said was, wow! Sarah’s Key is haunting, harrowing. The book delivers two parallel accounts: one detailing the fate, or rather doom, of the Starzinski family and especially of Sarah, and how knowing Sarah’s fate impacts the life of Julia Jarmond, an American journalist who has lived in Paris for half her life not knowing about the events surrounding the roundup at Vel’ d’Hiv. Sarah Starzinski’s character undergoes so many life-altering events in the summer of 1942, that her life is forever changed. She becomes an adult trapped in a girl’s body. She no longer knows happiness or believes in God. In contrast, Julia’s problems seem like peanuts, almost afterthoughts. In this book, though she clearly states from the beginning that it’s a fictional story, Tatiana De Rosnay masterly describes disturbing historical events that should not be forgotten. The main lesson to take from Sarah’s Key is that not only the Germans are guilty of the genocide of Jews during the Holocaust. French police sent Jews to their deaths, and many other nations conspired by keeping silent while the atrocities were taking place. These events forever altered the notion of what “civilized nations” are capable of. It is in the world’s best interest to remember the accounts, the suffering, so they never have to be experienced again by people of any religion or race. Sarah’s Key will make you think; it will change you! Hi there, there is a collection of book links happening right now at Carole's Chatter. This time we are collecting links to posts about your favourite historical fiction. Here is the link Your Favourite Historical Fiction Please do pop by and link in – maybe this one? Have a lovely day. Thanks for the invite Carole. I liked your blog very much and became a follower. PS I am now following your blog. It would make my day if you followed Carole's Chatter – or are you already? I loved this book even though it was sad. It did make me think. BTW, NEW FOLLOWER of your blog. Love your design. Stopping by from Carole's Your Favorite Historical Fiction Post. I am in that list as #4. Sarah's Key made me sad as well, particularly the fates of Sarah and her brother. Did you see the movie? I reviewed it too last year or the year prior. It follows the book closely and it's very well acted. Worth checking out.